The security of the information being relayed between warfighters, command and control, satellites, fiber connections, antennas, uplinks, downlinks, is highly reliant upon secure and viable network delivery. Without protected and intrusion-proof communication, todays military, government, NGO and first responder operations are open to failure. When lives are at stake, such is unacceptable. When the Royal Netherlands Navy needed 24/7 connectivity for a fast combat support ship, it turned to specialized Leasing Services from Stratos. Later, when the Navy required a new maritime messaging system, it adopted AmosConnect from Stratos. These solutions have substantially reduced costs and improved crew welfare. Today the Royal Netherlands Navy is pursuing Enhanced Leasing options for more of its vessels. Isodes Messaging and Directory Server software is used by Government, Militaries, Intelligence Services, Aviation Authorities and Commercial organizations worldwide. Isode is an Open Standards company that excels in providing robust, scaleable products and excellent support. Isode products are most often delivered as part of a larger system implemented by our network of solutions partners. 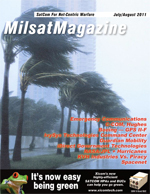 The MILSATCOM Joint Terminal Engineering Office (JTEO) conducts end-to-end terminal interoperability assessments of military satellite communication systems in support of the Military Satellite Communications Systems Wing (MCSW). This is the tenth anniversary of the event wherein those involved with the European hub for Military Satellite Communications gather and discuss national developments, international cooperation, and current operational challenges. Now in its 27th year, MILCOM has established itself as the premier international conference for military communications, attracting decision-makers from government, military, academia, and industry. The conference also gathers the brightest military and government communications subject matter experts from around the globe to engage in in-depth discussions about the latest in technology advancements. This makes MILCOM an ideal forum for industry to demonstrate how these technologies are being applied, and to promote products and services that provide reliable solutions to todays mission-critical challenges. The United States currently possesses the largest and most active space economy in the world. It is also the most technologically advanced, although other nations have excelled in certain aspects of space technology. The military services of the United States and its NATO allies have been and remain extensive users of satellite technology to support their military communications requirements. The purpose of this article is to provide a historical overview of the military communications satellites and its NATO allies. COMM OPS - Commercial Processes & Reliability, Can the U.S. Government Leverage the Benefits? As the U.S. Government (USG) comes under increasing pressure to contain costs for all types of space programs, the question of whether or not commercial providers can meet the needs of government programs has taken on new relevance. This is particularly true in the case of satellite communications, where the demand for capacity has continually outstripped the supply. By the time a new program launches its capacity is often already insufficient. This, along with typical schedule delays, necessitates gapfiller programs and reliance on commercial infrastructure for much of the communications demand. Delivering combat intelligence to the battlespace quickly and reliably is an essential element of modern warfare. As with so many other categories of mission-critical communication, our military depends on satellites to get that information to the deployed warfighter, regardless of the geography, environment, or operating conditions. Modern warfare, like those operations currently being conducted in Afghanistan and Iraq, relies on satcom to deliver tactical intelligence to combatant commanders to help formulate their tactical decisions. Enemy movements and strength level data, weather and terrain products, imagery and other forms of military intelligence (MI) can be transmitted to the battlespace via broadband satellite, and consumed by the tactical commander at near real-time speeds. Satellite communications represent a cost-effective and reliable means of transporting voice, video, and data to and from remote locations. However, as the adoption of satellite based networks continues to grow, so do the security challenges for operational and IT staff. Maintaining network connectivity and availability, preventing outside intrusions especially from foreign grounds, and closing the loop on vulnerabilities due to natural disasters and power outages, have all become mission critical components to managing the remote infrastructure at the edge. Army Aviation can trace its roots back to September 1908 when Orville Wright conducted a test flight of the Wright Flyer at Fort Myers, Virginia. The Wright Flyer reportedly flew about 100 feet in the air and stayed aloft for less than two minutes. A year later, the Army purchased its first airplane and Army Aviation was born.